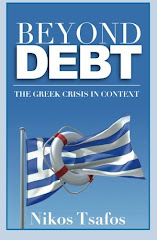 As Greece seeks a second bailout package to obviate the need to borrow money in 2012 and 2013, the government has unveiled more details on its medium-term strategy (2012-2015). The goal is to lower spending from 50% of GDP in 2011 to 44.8% in 2015 (a slight upward revision from the previous target of 44% in 2015). Meanwhile, revenues are expected to grow marginally from 42.6% of GDP to 43.2% of GDP in 2015. This is the cornerstone of the government’s plan and it has not changed much (see here). Look at the plan in detail. First, the macroeconomic assumptions have changed: GDP growth has come down by ½ percentage point with a 3.5% contraction forecast for 2011 versus the previous 3% (this too was down from initial -2.6%). Together with the ½ point higher-than-expected contraction in 2010 (-4.5% actual versus -4% expected), Greece’s 2011 GDP will end up 7.8% below 2009 levels versus the initially anticipated 6.5%. Greece also lowered its 2012 growth estimate to +0.8% from a previous +1.1%. The rest of the period – 2013 to 2015 – remains unchanged (the table below shows only nominal, not real GDP). The goal remains to bring the deficit down to 1.1% of GDP in 2015, although the targets for some of the intervening years have become slightly more aggressive. 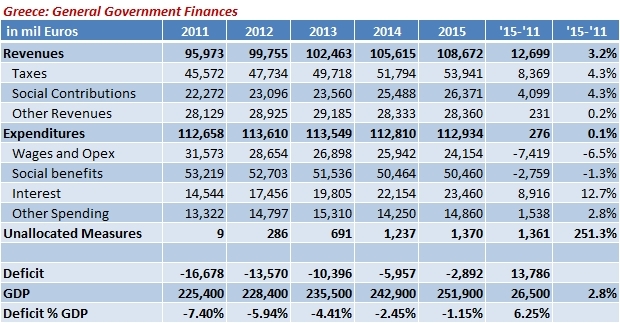 As shown in the table, Greece aims to lower its deficit from €16.6 billion in 2011 to €2.9 billion in 2015. To accomplish this fact, Greece is mostly targeting a consolidation of expenditures. Revenues are expected to grow at 3.2% a year, just slightly above the 2.8% growth in GDP. Hence, the share of revenues in GDP will increase marginally. Spending, by contrast, is expected to remain flat in nominal terms. 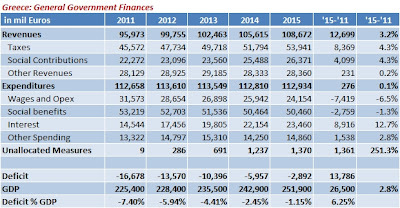 The main problem is a huge increase in spending for interest from €14.4 billion in 2011 to €23.4 billion in 2015. Hence, to keep spending flat, the government is mostly aiming to cut public sector wages and operating expenses for the government, followed by more modest reductions in social benefits. At the heart of that effort is the goal to shrink employment and standardize wages in the public sector: the goal is to reduce the number of public sector employees by 13%. What happens to debt? 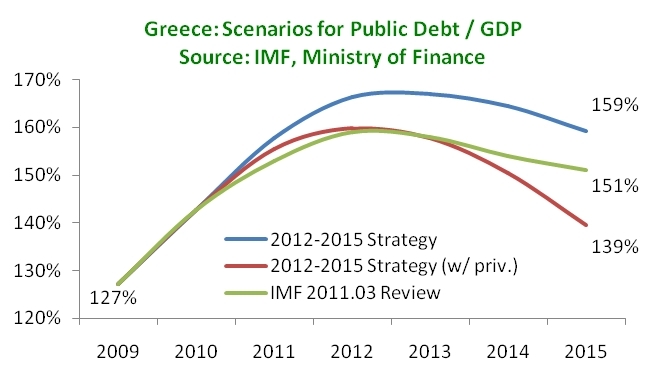 In its latest review (March), the IMF forecast Greece’s debt-to-GDP ratio at 151% of GDP in 2015. 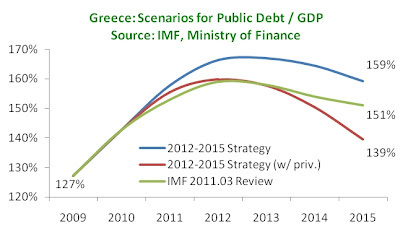 In its 2012-2015 strategy document, the Ministry of Finance shows two additional forecasts: the baseline forecast projects debt reaching 159% of GDP, although it is not clear why this number differs from the March IMF projection. Scenario 2 includes an aggressive privatization goal (see here), and if realized, would push debt to 139% of GDP by 2015. Longer term, debt would reach 100% by 2024 assuming a 3% average growth rate; with a higher (and probably unrealistic) growth rate of 5%, debt would drop below 100% in 2021. So what do we take from this program? First, this remains a spending-driven program and will succeed or fail in large part due to the government’s effort to restrain spending. Second, revenues are expected to rise merely in line with GDP – in which case, the continuous pressure on the government missing its revenue targets may be a bit exaggerated. Third, privatization receipts are now joining GDP growth as the most critical components of creating sustainable long-term finances. The long-term path remains very difficult, of course; but the medium strategy sets out to move the country in the right direction.